Fitness at its best can only be accomplished by the best equipment. The high weight capacity SF-RW5639 Full Motion Rowing Machine by Sunny Health and Fitness will help accomplish your fitness goals. The full motion movement of the arms will burn more calories, increase strength by activating more muscles in the back, shoulders, and core. 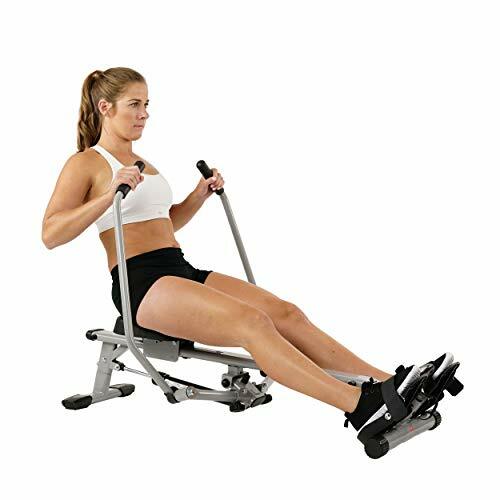 The rower allows you to work both arms simultaneously with equal resistance. Increase or decrease the workout intensity with a simple turn of the resistance knob. The integrated LCD digital monitor will track your stroke count, time, calories, and total count. The digital monitor is also equipped with a countdown feature for time, calories and stroke. This feature is great to add more workout variations to increase the challenge of your workouts. The SF-RW5639 Full Motion Rowing Machine is equipped with a large fully padded seat, non slip handles bars, and large anti-slip foot pedals with adjustable straps. The rower has a weight capacity of 350 lbs. Keep driving forward with the SF-RW5639 Full Motion Rowing Machine by Sunny Health and Fitness.